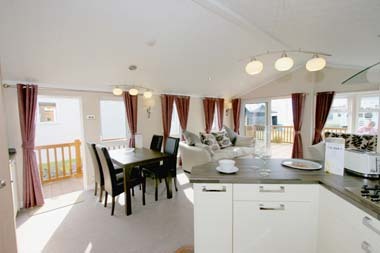 The Willerby Key West lodge has been refreshed and updated for 2013. In this review, we’ll look at the two bedroom 40×16 ft model. 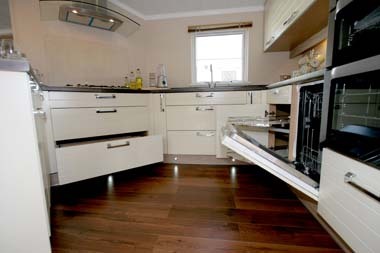 In the kitchen, opposite the side aspect door, the cream base and eye level units co-ordinate well with the walnut effect butcher’s block worktops. 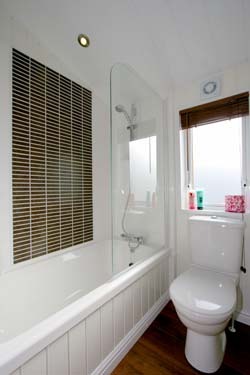 Good use of space has been made with pull-out wire baskets and a carousel corner unit. A high line built-in gas oven, grill and microwave are complemented by a five burner gas hob with a curved glass and stainless steel extractor fan. Plinth lighting is a feature and coffee aficionados will appreciate the built-in coffee machine, included in the well-specified kitchen which also includes a fridge, freezer, dishwasher and washer/dryer; the latter is fitted in a spacious hall cupboard that also houses the boiler. An angled room divider keeps the kitchen in the open plan living and dining area, which are bathed in light from the patio doors, feature bay window and three-quarter height windows. These have plush purple drapes hung on chrome poles and give a regal appearance whilst harmonising with the three-seat sofa and the cosy “Love” seat. The optional television and flame effect electric fire are well placed for kicking back and relaxing. The dining area, in front of a window, has four faux leather dark brown chairs surrounding an ebony look table and a pendant light hanging over it. 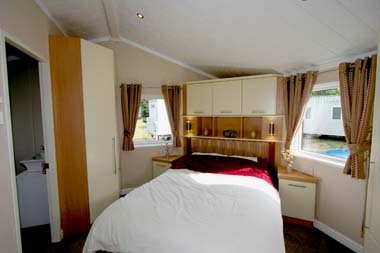 The main bedroom has king size bed with a lift up storage and a concealed storage behind the feature padded headboard. 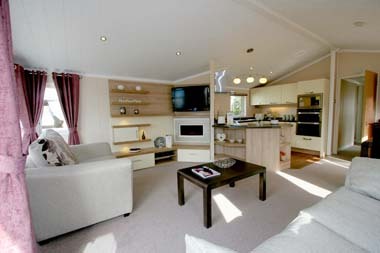 Unusually the bed is set at an angle across the corner and there are more cupboards, drawers, shelves than any reasonable couple could wish for in a holiday home. The colour scheme of claret, gold and cream is rich and sumptuous. 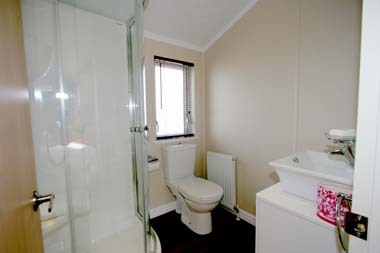 Add to this, an en-suite shower room with a basin mounted on vanity unit, a dual flush lavatory and a one-piece quadrant shower and you could easily be staying in an up-market hotel. 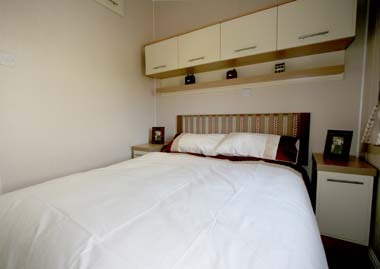 The second bedroom is not second class with its king size bed, although twin beds are possible as an option, and another walk-in wardrobe. There’s even access to high level storage space in the roof. The family bathroom has a one-piece fibreglass bath inset with a feature tile ceramic wall; I think that will be practical to keep clean along with the panel effect walls. 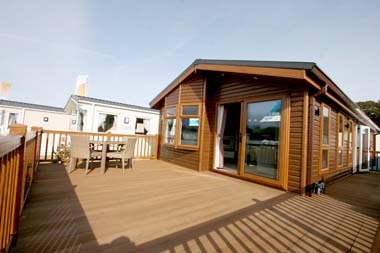 The Key West as seen was built to EN1647 standard for temporary holiday use and is not designed for residential purposes but it can be built to residential standard BS 3632 at the time of ordering. Please refer to the park licence and associated planning conditions when determining the standard you want. It’s loving living! The Key West has twice been voted “The Lodge of the Year” at a key industry award ceremony. For 2013 it has undergone an interior make-over, has updated canopy lights on the exterior and a new more efficient and energy saving boiler. Several optional extras are available including the timber exterior cladding and new mid-oak window and door frames we saw. It’s certainly worthy of winning further accolades. Additional charges will be made by park operators, and/or distributors for transportation, siting and annual maintenance. Please check the price carefully before you commit to purchase, as prices vary considerably dependent, amongst other factors, on the geographical location of your chosen park.